Approach Poole from east or west on the A35. At the large roundabout which circles the Civic Centre take the exit to the town centre but immediately turn left in through the park gates. Poole Park is an interesting park laid out around a very large boating lake and some attractive duck ponds. Apologies: Due to extensive renovation work around the lakes by Poole Borough Council several control points are missing and the route around the lake is temporarily shut. We will rearrange the map and information later this year following completion of the changes. Courses of 1.0, 2.1 and 3.1 km are available. The park is open all the year, parking is free but it can get tight on Sunday afternoons, especially in the summer season. Toilets are available at the east end of the park and in “The Arc” café which provides refreshments. There are also boats for hire on the pond, boules, tennis, ducks & swans and plenty of scope for picnics and games. The lovely new “Kitchen” restaurant, overlooking the lake, completes the picture. 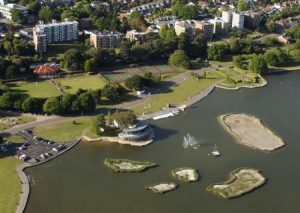 Borough of Poole maintains Poole Park Facilities if you are looking for information that is not specific for the POC hosted on the site.